Robin is a leader in her industry and exemplifies excellence in family business. Her participation as a speaker at Kellogg events brings a real-world expertise that benefits students. Kellogg School graduate Robin Brooks' special expertise in business — placing a dollar figure on hard-to-value assets — at first appears unrelated to her present role as CEO and owner of a company that manufactures frozen foods. For nearly 20 years, Brooks '79 built a career in the valuation departments of large consulting firms and smaller boutique operations, quantifying the worth of trade names, customer lists and credit card bases. She helped Nestlé put a dollar figure on its trademarks and tradenames when it acquired Carnation Co. in 1985 and Williams and Humbert decide on a licensing fee for its Dry Sack sherry brand. But when it came time for the second act of her career, purchasing and retooling a food manufacturing company with her late husband, Franklin, Brooks continued to rely on the skills she had honed at firms such as Arthur D. Little and Deloitte & Touche. Her first step: to sort out the money-losing company's assets and contracts to arrive at a fair purchase price. "I think we got a better price than we otherwise would have gotten," Brooks says of the 1995 purchase from McCormick & Co. "When we were negotiating we were able to say, 'There's a lot of risk associated with this particular contract,' or to tie our purchase price to a supply agreement. I'm not sure that everyone would have looked at this acquisition the same way." 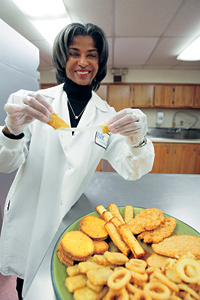 Today, the Bedford, Va.-based Brooks Food Group boasts 360 employees and is listed among Black Enterprise's top 100 firms. The company works with high-profile restaurant chains to develop specialized frozen food recipes. Clients and products include Wendy's chicken nuggets, Ruby Tuesday's mozzarella sticks and The Olive Garden's parmesan-crusted chicken filet. Brooks says her industry is highly competitive, demands product consistency and has a low profit margin. Quick-service restaurant chains require their food be uniform in size, weight and number of pieces, but still "want it to look homemade," she says, laughing at the predicament. "We manage to get quite a bit of market share and I think it's because of our size," she adds. "We don't have all these layers of overhead and management so that's not included in the pricing." Brooks' valuation skills again came into play in 1998 when Brooks Food Group sought to add a second plant in Monroe, N.C. It was Brooks who acquired and renovated the plant, bought equipment and managed regulatory issues. Frank Brooks, meanwhile, was running the Virginia plant while fighting the cancer with which he had recently been diagnosed. When Frank, who had filled the role of CEO, succumbed to the disease in 1999, Robin had an enormous decision to make: how to proceed with the company? Buoyed by her success in acquiring the company's second plant — a process that served as a crash course in operations, Frank's specialty — Robin decided to assume the chief leadership responsibilities. "We had always thought, 'Wouldn't it be great if we could have a food manufacturing company of a significant size?' We had such complementary skills. When he passed, I felt obligated in a way to fulfill the vision," Brooks recounts. "We had just closed on the new plant and weren't yet where we wanted to be." Today she believes Frank would be proud of her successes. Ten years later, the new plant is more profitable than what the couple predicted when they applied for financing. Valuing and managing intangible assets remains Brooks' strength. She also mentors others, particularly women (the company says that fully half of its managers are female), and enjoys a continuing relationship with the Kellogg School, where she was a keynote speaker at the Black Management Association conference this spring. "I truly value relationships with customers and employees," Brooks says. "We are generous with our benefits for a company of our size. I want our employees to live happy, healthy, whole lives."